As far as headphones go these days, it seems everyone's trying to get in on the action. 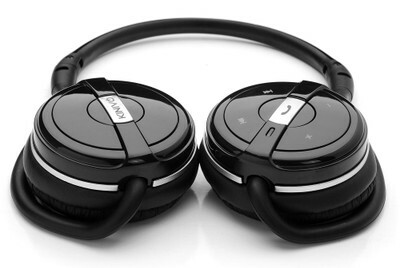 Up next is the Kinivo BTH240 Bluetooth Stereo Headset. Yep - that's the name. No cool name like the Kinivo Rocker, or anything, just a combination of letters and numbers. We at Mashbuttons are sent product to review very frequently, but as far as first impressions go, the Kinivo BTH240's aren't out to win any awards for presentation. Arriving in a fairly generic packaging, the BTH240's are a Bluetooth Headset that come with a little felt pouch, built in Lithium Polymer battery, and supports hands-free calling as well. Nice features to be sure, but how is the rest? At first, I thought they were too small, then I realized these aren't your typical over-the-head headphones, but rather the ones that, that go around the neck (that had some popularity back in the early 2000's if you recall). I was never a big fan of these styles, so it took some getting used to. Once you slide the headphones out of their case, they are folded up in a compact fashion. Unfolding them is almost an art form, due to the fact the plastic they're made from feels so thin, you may come dangerously close to breaking. Sliding them over your head, and around your neck, to see what these cans can do, once you've paired them up with your device (iPhone, iPod, iPad, Android phone, basically anything that supports Bluetooth 2.1), which is a relatively easy process, you can start to use them quickly. And how do they sound? I guess to be honest, they don't sound half bad. Obviously, these aren't designed to compete with the Beats by Dre, or the DNA by Monster, or Bose headphones. These are designed to be a little bit better than the factory options included by the likes of Apple, Samsung, etc. I found the smaller diameter speakers sort of sit over your ears, not covering them, so there is some sound leakage, and a loss of comfort over time. I prefer my Sony's that fully wrap my ears in a leather-bound pillow of sound. But the sound of the Kinivo's are decent; their volume approaches levels that are uncomfortable. Bass is fine, and treble isn't muted (which is good). Too often speakers get one or the other right (too bass-y, and muted highs), and though these aren't anything an audiophile would rave about, nor really anyone else. As a whole we wouldn't really recommend these headphones, when there are a variety out there in a similar price range that are much better (just about any off the rack at your local Best Buy would suffice) or go with the good ol' trusty Sony MDR-V6's for about double the cost. Support for hands-free calling, automatically muting music when a call comes in.